Venice freshman pitcher Karsyn Rutherford fired two scoreless inning in her return from what was believed to be a muscle tear in her shoulder — but was recently discovered to just be a sprain. Indians sophomore Becka Mellor slides safely into home as Venice takes a 1-0 lead over Manatee in the second inning. Indians catcher Kay Holland laces a double to right-centerfield as she drives in Becka Mellor for the first run of the game. 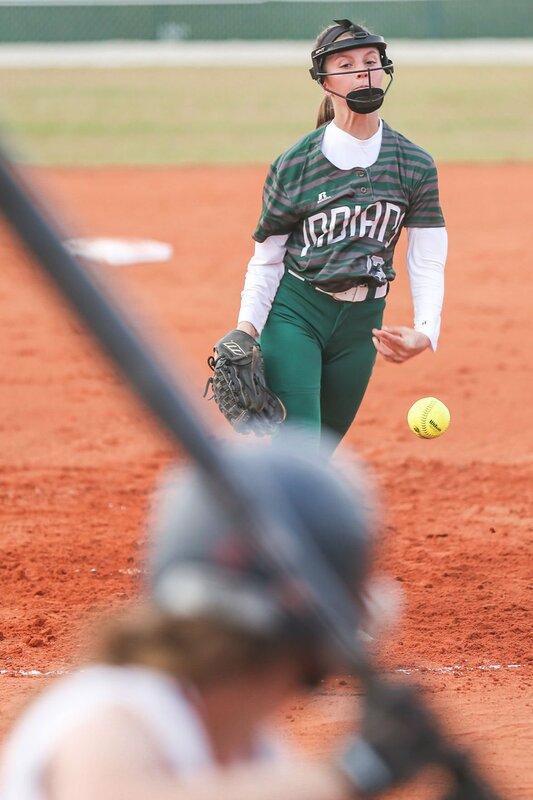 In what came as a surprise to just about everyone at the Venice softball field on Friday night, Karsyn Rutherford took the mound for the Lady Indians — pitching two scoreless innings in a 2-1 Venice win over visiting Manatee. Previously thought to be lost for the season with a muscle tear in her shoulder, it was recently discovered that Rutherford had only strained the muscle. So, just before Friday night’s game against Manatee, Venice coach Steve Constantino revealed to his team that their ace would be returning to the mound. “Once we made the announcement she was back, the whole team jumped up and down like we just won the World Series,” Constantino said. “That shows you how important she is to us. Though Rutherford said she didn’t feel quite at 100 percent in her start, she worked so efficiently in the first inning — setting the Hurricanes down 1-2-3 on 11 pitches — that Constantino allowed her to pitch the second inning as well. She allowed two singles in the second, but escaped the jam unscathed. Going forward, she said she’s aiming to build back her strength in time for the playoffs. “I actually didn’t know I was going to pitch today,” she said. “I wasn’t really prepared, but I was really happy to hear that. It felt really good to be back. Once Rutherford’s night was done, the Venice offense seized the lead for good. After Becka Mellor reached base on an error and advanced to second, Indians catcher Kay Holland came through with an RBI double to the right-centerfield fence. Three innings later, Venice made its lead 2-0 when Tatum McGrath’s line drive back at the pitcher couldn’t be caught and another run crossed home. Following Rutherford was another Venice pitcher working her way back from injury in Haley Adrian. After missing her junior season with a knee injury, Adrian has steadily regained her form over the 2019 season. On Friday night, she allowed just one run on four hits as the Hurricanes failed to mount much of a rally. Adrian was pulled from the game as she allowed a leadoff single in the sixth. On in relief, Micaela Hartman allowed the runner to score on a sacrifice fly, but otherwise silenced the Manatee bats — finishing the final inning in 1-2-3 fashion. While the 2-1 win doesn’t change much about Venice’s season, the successful return of one its most promising players is a different story. But playoffs aspirations aside, Rutherford was happy to simply be back on the mound — somewhere she thought she wouldn’t be until next season.